Karl Foerster feather reed grass was named Perennial Plant of the Year in 2001 by the Perennial Plant Association. This ornamental grass is very attractive and versatile. It requires very little maintenance to look great. The green grassy foliage appears in early spring and lasts until early winter. In late spring, light pink feathery plumes appear. They gradually fade to a golden tan in the fall. The vertical growth habit of this grass creates a nice contrast in the garden. Like other ornamental grasses, Karl Foerster adds movement and sound to the garden as well when the wind picks up. Karl Foerster feather reed grass is what is known as a "metamorphic grass." This is described as being in perpetual motion. The slightest breeze sets this grass waving, creating a graceful appearance to the landscape. Use the grass in a mass planting for the best effect. Plant it by a water feature and you also get treated to the reflection of this movement. Feather reed grass can also be used as a specimen to add vertical contrast with plants that have round or horizontal shapes. It makes a nice screen along property lines. Some people like it in patio pots. The grass tassels can be cut and used in fresh or dried flower arrangements. If they are cut before they mature, the cut stems will last for months. Rainstorms will flatten the plant temporarily, but they spring back upright shortly after the storm has passed. Combine this feather reed grass with coreopsis, liatris, Echinacea or rudbeckia for a lovely garden. 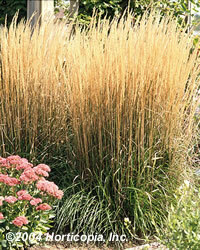 Karl Foerster feather reed grass is a low maintenance addition to the garden. This long living perennial grass loves full sun but it can tolerate partial shade. It does best in well drained fertile soil but will tolerate heavier clay soils and drier sites. Fertilizer helps ensure that your grass reaches its full potential. It is relatively free of disease and insects.